My son decided on us being characters from the My Singing Monsters video games. We chose our favorite characters from the game, since we all play it. Every year my son comes up with the ideas for our costumes and I start constructing them. We love to be original, its more and the reactions we get from family and friends is GREAT! All of our heads are made out of plastic flower pots, duct tape, and a large car sponge. The materials I used for the Pom Pom characters were purple and red fleece, ribbon, tule, felt, yard, beads, stickers, paper straws, pipe cleaners, and plastic mesh. The Attmoz was made from a purple fleece onesie, paper mache spikes along the arms and back, two sponge swords from Dollar Tree that I cut and fed wire through to shape, purple fleece for the fingers, boot covers, and tail. His head and beard were covered in white sherpa as well as his arms. The eye is made from a large paper mache egg that I cut in half and flattened, plastic mesh was added so my son could see. All the spikes, horns, and eye was hand painted with latex paint and hot glued to the costume. Glowl is made out of multicolored felt squares cut into the shape of feathers and hot glued to a long sleeved orange shirt. Her wings (shields) are made of thick poster board and more felt feathers were hot glued on. Her head is covered in white fleece and the beak is made of cardboard shaped into a triangle and covered with orange felt. Mammot is made entirely out of sherpa fabric. It was the warmest costume. I used an extra large flowerpot for the head and cut out the sides so it could rest on his shoulders. The eyes are painted plastic mesh and the mouth is made out of felt and then attached to the head. I sewed the sherpa shirt and attached all 6 fingers. they were made out of pink felt that i rolled and stuffed with cotton. His feet are made out of an old pair of slippers. I used masking tape to flatten the teddy bear face and used foam to create toes and then covered them with masking tape.Then i covered the toes with pink felt and brown felt for toe and finger nails. Then I hot glued the sherpa to the top of the slippers and wrapped it around his legs. I sewed up the back and added elastic at the top so they would not fall down. The flower pot head need eye cut out with a box cutter. They need to be large because i hot glue the plastic mesh to the inside. Then I paint the eye balls and detail with latex paint and you can see just fine through all the tiny square opening. You need to go back in and put felt around the rough edges on the inside of the eyes. If anything else was to be cut out of the plastic, I would cover all rough edges with duct or masking tape to smooth. The car sponge is to create a rounded top of the head. you cut the am ought you need and tape to the top creating a dome. Once everything is taped, you can start hot gluing the fabric, this is where i always burn several fingers. 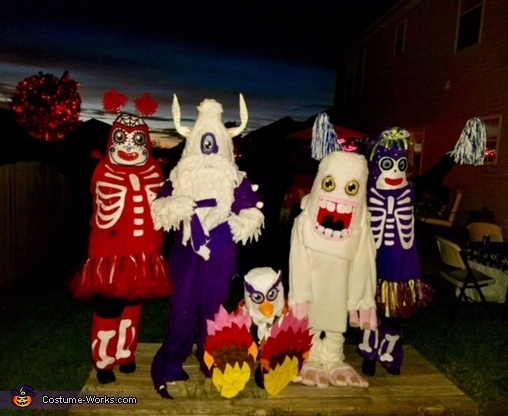 I have used this method for making a number of costumes in the past as well as Mascots for school. I made the tunics for the Pom Poms by simply tracing a tunic Chasity and I already owned and then i sewed the sides. The skeleton bones are all made of white felt that i drew and cut out and then hot glued to the tunic. Our boot covers were made of fleece that i wrapped around our boots and sewed up the back, then attached the felt bones as well. Our sugar skulls were made from felt that we each designed and then hot glued to the head. we added stickers, beads, and pipe cleaners. My red Pom Pom's pigtails were made from yarn and attached to 2 paper straws cut in half and glued to the top of the head. They are accented in glittery tule, as well as the shoulders and tutu. The purple Pom Pom's hair is made from left over purple fleece and green ribbon I cut into strips and attached one by one with hot glue. The only items I did not make were our pom poms we were holding. We wore black leggings and a black long sleeved shirt under our tunics. I think that covers all 5 costumes. This took me about 4 weeks to build each and every one of them. The are so fun to create! Lets see, the cost? I'd say around $250 to $300. The most expensive pieces were the pom poms and the purple onesie. Still not too bad for 5 costumes. I just want to say thank you for running this costume contest. Good luck to everyone!! I love looking at all the creative costumes.